It's hard to believe that we won't see two dozen women fighting over one gentleman (we use that term loosely) until next year, but we'll survive with the help of season five of Bachelor in Paradise. If you're a die-hard Bachelor watcher, season 23's start date probably doesn't come as too much of a surprise. Past seasons of the dramatic show have premiered on the first Monday of the new year. 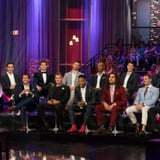 Season 22 with Arie Luyendyk Jr. kicked off on Jan. 1, 2018, and season 21 with Nick Viall premiered on Jan. 2, 2017. History has a way of repeating itself with this franchise, so it's fair to guess that we'll see the next Bachelor season premiering on the first Monday of the year, which falls on Jan. 7, 2019. Although this seems so far away, think about how you'll get to enjoy the holidays and, just as that settles down, your Monday nights will have meaning again.